Map 15 Rock and Spindle–Craigduff, St Andrews. 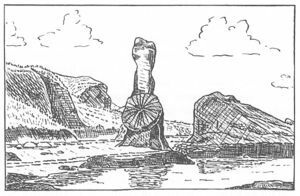 Figure 9 The Rock and Spindle, Kinkell Braes, St Andrews. The radiating spokes of the 'spindle' are of columnar-jointed basalt; the tall 'rock' is of xenolithic basalt. The cliffs and stack in the background are composed of bedded tuff, all lying within the Rock and Spindle Vent. Figure 10 The Craigduff Dome seen from the cliffs of the Kinkell Braes, St Andrews. In this structure the Carboniferous sandstones dip outwards in all directions at 18–20°. Walking distance 3.25 km on grassy paths, 3 km on rocky shore. 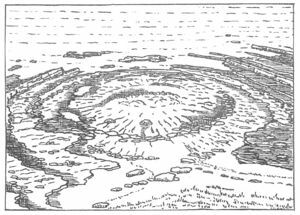 (2) a series of exceptionally well exposed Carboniferous volcanic vents or necks which permits the study of the mechanism of emplacement and stages of development believed to be typical of such vents in Fife; (3) folding and faulting affecting both the sedimentary and igneous rocks. Much information on both the detail and the broad setting of these rocks is to be found in Forsyth and Chisholm (1977). Since this is a coastal excursion it should be carried out at as near low tide as possible. Route On foot for 2.5 km from the East Sands at St Andrews, following the coastal path as for Excursion 9 until a branch leaves the cliff top and descends to the postglacial raised beach at the far end of the Kinkell Braes, 1.3 km from the East Sands, and thereafter continuing on this path for a further 550 m to Kinkell Ness [NO 537 157] at the western end of the shore section to be examined. Kinkell Ness is composed of sandstones dipping to the north at 20° and lying between 120 m and 150 m stratigraphically above the local Strathclyde Group marker horizon, the Witch Lake Marine Band. The sandstones are cross-bedded, cream-coloured and contain plant fragments. Small veins of better cemented sandstones stand out on weathered surfaces. A prominent low stack near HWM marks the northern limit of the Kinkell Ness Vent, sometimes known as the Rock and Spindle Vent. The stack is formed of basalt packed with sedimentary xenoliths (especially sandstone) round the margins and xenoliths of igneous material towards the centre. Parts of the host rock near the centre are sufficently free of xenoliths to show its basaltic nature. The initial volcanic outburst consisting mainly of gas discharge which produced the vent or pipe. Repeated pyroclastic activity, the formation of the bedded tuff cone and subsequent collapse of the bedded tuff into the vent. Emplacement of vent intrusions consisting of basalt generally packed with xenoliths, but locally relatively free of these. Emplacement of basalt dykes which may extend outside the vent. The northern stack clearly comprises rocks from the third stage in this sequence, which are separated from the main part of the vent by rocks belonging to the first two stages. The second stage rocks should be examined 45 m south-east of the stack where they consist of: (a) blocks of sandstone up to 6 m across with quite random orientation, the bedding lying in attitudes varying from vertical to horizontal; (b) agglomerate or tuff composed of fragments, usually a few cms across, of shales, sandstones, 'rotten' lava and white trap; (c) a matrix which is fine grained and seems to be simply an aggregate of much smaller fragments of the same rocks. Kirk (1925b) records sand grains and tiny rock fragments in the tuff. The relationship of this tuff to the sandstone blocks serves to illustrate the mechanism of intrusion at an early stage in the history of the vent. The fine grained tuff can be seen to penetrate into cracks and joints in the sandstone while in several places the bedding of the sandstone is destroyed, the resultant rock being a mixture of sandstone and fine tuff. Such a relationship suggests very strongly that gas action has broken down the cohesion of the sandstone and, to judge from the amount of fine shaly dust in the tuff, it seems probable that the shales of the country rocks have been broken down in a similar fashion. On the northern side of the large eastern extension of the vent which runs down to LWM, the margin of the main vent is exposed. The contact with the sandstones of the country rocks is sharp and the latter may have been slightly baked. At this point the vent is occupied by poorly bedded tuff, often quite coarse, which, on erosion by the sea, gives rise to a more even surface than the sandstones. Elsewhere the contacts are seldom exposed. Eighteen metres south of the large sandstone blocks within the vent at Locality 2, examine another mass of basalt, also packed with xenoliths and forming the next stack close to HWM. This has, at its southern end, a well exposed contact with the bedded tuff. The basalt is altered for up to 10 cm from the contact and has taken on a pale green colour. Xenoliths in the basalt consist of older basalt, sandstone, shale, mud-stone, coal and finely bedded tuff. This exposure lies just north of the point where the road from Kinkell Farm reaches the shore. Bedded tuff is well seen on the wave cut platform just in front of the point where the road reaches the shore. Bedded tuff also forms the next massive stack, 6 m high, some 24 m NNE of the Rock and Spindle. In the massive stack, graded bedding, with the finer beds repeated every 15 cm or so, can be examined (especially on the seaward face). Larger blocks are scattered through the tuff and occasionally cross bedding can be discerned. Among the larger blocks, dark masses of lava and dove-grey limestones (which weather almost white) are conspicuous. The latter sometimes contain the coral Lithostrotion and crinoid ossicles. Although the bedding in the tuff is approximately vertical throughout this area, the direction of the top of the succession can be ascertained from the graded bedding and also from the rare signs of large fragments having dropped into the soft tuff and disrupted the bedding. 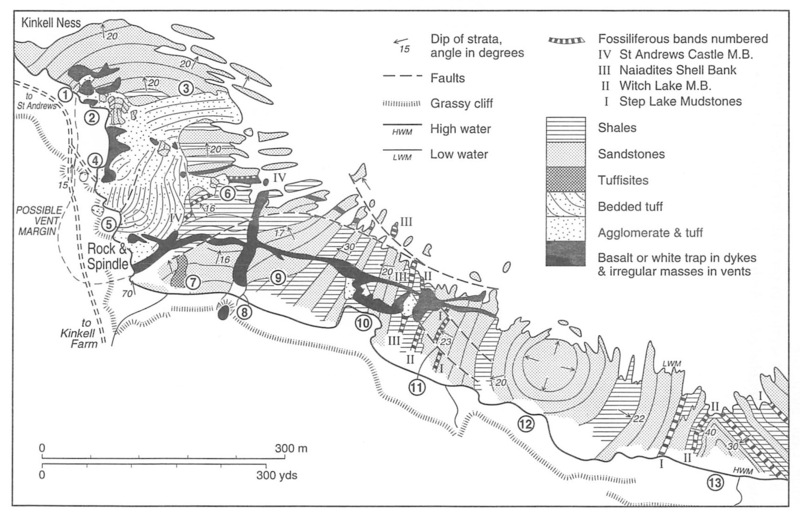 The steep dip of the tuff is undoubtedly a result of collapse of the bedded tuff (presumably in a cone) into the vent after eruption as envisaged by Francis (1962, p. 56, fig 7) and Forsyth and Chisholm (1977, p. 200). The arcuate strike of the tuff suggests a volcanic centre somewhere near the end of the road where it reaches the beach. Beyond an east–west fault the tuff strikes north-east, but the bedding disappears when followed further. The eastern side of the vent 110 m north-east of the Rock and Spindle stack is packed with large masses of sediment. These consist mainly of sandstone, but include blocks of limestone up to 2 m long. The orientation of the large blocks is random, but the bedding in the tuff is very approximately parallel to the vent margin. Another smaller extension of the vent lies beyond this area to the east and a dyke, now altered to white trap, extends still further to the east along the outcrop of the St Andrews Castle Marine Band. This band consists principally of marine shales, bearing abundant ironstone nodules and thin limestone bands at most a few centimetres thick. Naiadites is commonly present in the shales. 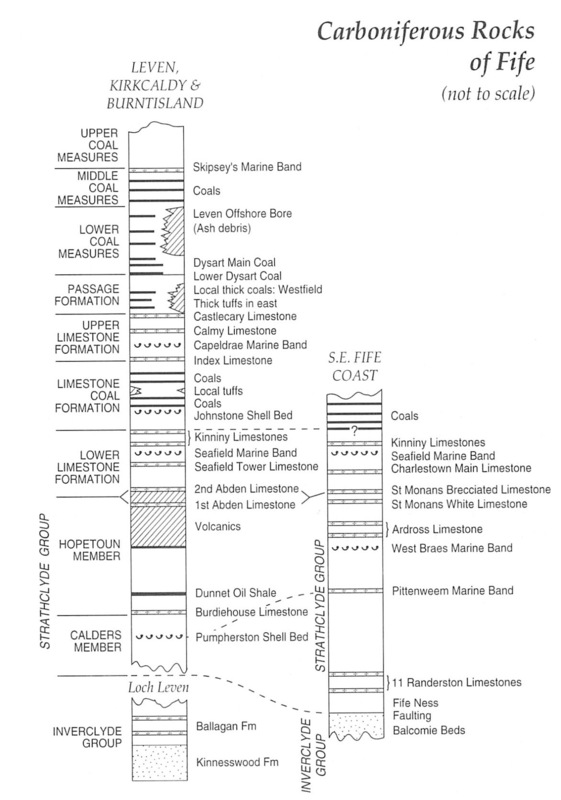 By following this marine band westwards extensive small scale faulting can be discerned. The outcrop of the St Andrews Castle Marine Band is then interrupted by the vent for 25 m before it can once more be picked up and followed through a further series of minor faults. Beyond this it terminates against the vent margin, 70 m to the south-west. At this point, the vent margin is steep and the peripheral xenolithic basalt intrusion stands up as much as 3 m above the soft shales of the country rock. Cutting both this intrusion and the shales is a basalt dyke of stage iv that can be followed westwards through the bedded tuff to the Rock and Spindle. The Rock and Spindle is a basalt mass of stage iii, in the main richly xenolithic, especially in the tall thin 'Rock'. The 'Spindle' on the other hand, is relatively free of xenoliths and shows good columnar jointing, the radial pattern of which indicates a pipe-like form. No clear boundary between this rock and the xenolithic rock can be discerned and they are probably part of the same intrusion. The contact between the intrusion and the bedded tuff can be followed readily on the western side of the stack while at the northern side, it is possible to determine that dyke emplacement occurred very late in the history of the vent since a 0.5 m basalt dyke cuts both the bedded tuff and the xenolithic basalt. At the top of the beach, just outside the margin of the Kinkell Ness Vent, there is evidence for the collapse of not only the bedded tuff, but also some country rock into the vent. For a few metres outside the probable position of the margin, the country rocks dip at 70° into the vent in marked contrast to its dip of 16°–18° to the north a short distance further south. Twenty-five metres south-east from the vent margin notice a gap about 12 m wide in the thick sandstone, running due north and narrowing in that direction. The narrow northern end of the gap merits careful examination. It is the locus of a stage i vent (Kirk 1925b) occupied by randomly arranged blocks of shale and sandstone in a shaly matrix, quite free from igneous material, a rock often referred to as tuffisite. It is what Geikie (1902, p. 210) called an explosion fissure, presumably formed by the upward passage of hot gases. The country rocks along its margins are slightly indurated and shattered. Twenty-five metres north of this vent the dyke cutting the south-east margin of the Kinkell Ness Neck is again met in the shales beneath the St Andrews Castle Marine Band. If time permits, its complex course, controlled by faulting, should be followed eastwards for 90 m to the next vent. This vent, 155 m long by 12 m wide, is dyke-like in form and has been emplaced along the line of a pre-existing minor fault. It is cut by the small dyke referred to above and also by a later tear fault, which displaces the vent dextrally by 12 m. Except at its two ends, the vent has been eroded out by the sea to form a trough on the beach. Near its centre the vent is composed principally of basalt, but towards its margins it is packed with xenoliths of now thermally metamorphosed country rock. Towards HWM the basalt gradually alters to white trap and contains many calcite veins. Locally along the margins, relics of tuff from early stages of emplacement remain. The sandstone cut by the southern part of this vent overlies a series of shales and an examination of the base of the sandstone between 4.5 m and 45 m east from the vent reveals very clearly a surface cut into the beds beneath. At least 3 m of shaly beds are successively cut out as the surface is traced down the beach to the north-east. Above the cross-cutting surface a few centimetres of thin-bedded sandstone are everywhere succeeded by 10–15 cm of grey shales with ironstone nodules. Only above this is there a thick cross-bedded sandstone with clear channels cut into the underlying beds. By analogy with the modern sediments of the Mississippi delta the cross-cutting surface is likely to mark the site of a slump scar in the unconsolidated sediments on which a mass of sediment has moved downslope. Only later have the thin-bedded sandstone and the shales been deposited on the surface of the slump scar. Forty-five metres downshore, the sediments are cut by the dyke mentioned above. Inconspicuously exposed, the dyke is altered to white trap, in both the shale and the sandstone. It continues east to the Craigduff Vents and beyond before disappearing under the sea. 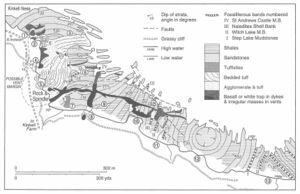 The irregular form of the Craigduff Vents can be seen from the map. They are occupied in the main by xenolithic basalt, but also contain a little tuff. The country rocks have been baked and some of the adjacent sandstone now stands up as quartzite stacks on the shore. Inspection of the map reveals that a mass of sandstone is almost entirely cut off within the vents though maintaining its original dip and strike. At the eastern end of this mass, the vent margin can be clearly seen. Rafts of sediment are present in the basalt and are thoroughly baked. Some basalt, relatively free from xenoliths, occurs in the eastern part of this series of vents; this rock has developed horizontal columnar jointing and forms a small stack. Within the central area of the series, a patch of tuff has been eroded by the sea to leave a gap in the shore crags. On the shore opposite this examine one of the most striking exposures in the Strathclyde Group sediments, a yellow or buff weathering Naiadites shell bed which can be seen to thin from 2 m to 0.7 m within a few metres when traced up the shore. This is the Myalina limestone referred to by Geikie (1902, p. 213) and Kirk (1925a, p. 368). A few centimetres beneath this limestone is a 30 cm coal seam resting on a seatearth. Both the limestone and the coal are abruptly truncated by the vents and fragments of limestone have been found within the vents. The thermal metamorphism adjacent to the vent is very pronounced in the coal, a natural coke having been produced in the seam for about 30 cm outwards from the contact, and the vesicles in the coal are filled with white calcite. This rock is, however, no longer exposed. Twenty metres east of the Naiadites shell bed, the Witch Lake Marine Band outcrops as a 15 cm limestone band in about 6 m of dark grey shale. This sequence of richly fossiliferous beds, containing brachiopods, bivalves and gastropods, is underlain by sandstones then shales. These richly fossiliferous beds are then followed 40 m further east by the Step Lake Mudstones, only about 3 m thick and here consisting of dark grey mud-stones with calcareous nodules. The outcrop of these two bands is interrupted by a sinistral tear fault with an 18 m displacement and striking NNW. The strata intervening between the Step Lake Mudstones and the centre of the Craigduff Dome [NO 543 154] comprise 55 m of mainly yellow-weathering, grey sandstones with a 9 m shale interrupting the continuity. Ironstone nodules occur in the shale which is not, however, very fossiliferous. The sea has eroded the shale away round much of the dome, thus serving to accentuate this structure. The dome itself is remarkably symmetrical, the dips being 18°–20° outwards in all directions. At its centre the sandstones have been eroded by the sea into grotesque shapes, partly controlled by cementing along ramifying calcite veins. One hundred and eighty metres east of the Craigduff Dome, the Step Lake Mudstones and the Witch Lake Marine Band may be examined once more on both sides of the Craigduff Syncline. Between them occurs an example of a sandstone with an erosional base cut into the beds beneath. In the beds overlying the Step Lake Mudstones on the eastern side of the syncline, there are only 3 m of sandstone overlying 25 m of shale. On the western side, however, there is a 12 m sandstone immediately above the Step Lake Mudstones. Follow the base of this sandstone downshore. It can be seen to rise steadily from the shales which are readily recognised here on account of the 50 cm thick hematitically weathering limestone within them. The sandstone is cross-bedded and truncates successive beds of shale when followed up the shore. Rip-up clasts of shale are present in the basal part of the sandstone. At the top of this thick sandstone, a 60 cm band of muddy Naiadites limestone is locally present on the western side of the syncline, but is absent elsewhere. Small faults which provided accommodation during the folding of the syncline can be observed in the sandstone above the Witch Lake Marine Band, especially where puckering is present in the shale. Return to St Andrews by the coastal path via Kinkell. Braes. FORSYTH, I. H. and CHISHOLM, J. I., 1977. The geology of East Fife. Mem. Geol. Surv. G.B. FRANCIS, E. H., 1962. Volcanic neck emplacement and subsidence structures at Dunbar, Southeast Scotland. Trans. Roy. Soc. Edinb., 65, 41–58. KIRK, S. R., 1925a. The geology of the coast between Kinkell Ness and Kingask, Fifeshire. Trans. Edinb. Geol. Soc., 11, 366–82. KIRK, S. R., 1925b. A coast section in the Calciferous Sandstone Series of Eastern Fife. Unpublished St Andrews University Ph.D. thesis. This page was last modified on 23 February 2019, at 10:11.